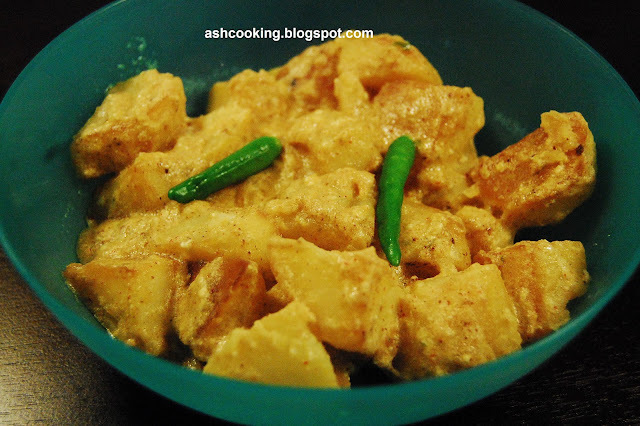 The below recipe is a simple concoction of traditional alu dum with very less spices used, yet standing out in taste. I have got this recipe from a leading Bengali magazine "Sananda" where they featured some authentic recipes of thakurbari i.e the cuisines hailing directly from the kitchen of Tagore family. Until now, I really had no idea that alu dum could be so tasty with such minimal ingredients gone into it. 1) Beat yogurt, dry red chilli powder, salt and sugar together in a bowl. Add all-purpose flour into it and beat again to a smooth consistency. 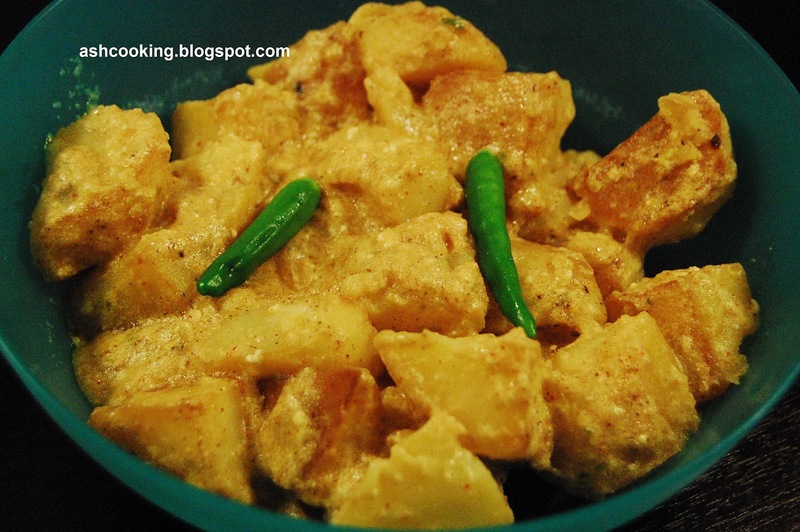 2) Heat mustard oil in a wok; add the boiled potatoes and shallow fry them till they change into a golden brown color. 3) Add the yogurt mixture and green chilli paste. Mix in properly and cook for 2 minutes. 4) Meanwhile, in another pan, heat ghee and add hing powder. When hing sizzles and a beautiful aroma comes out, mix it into the potato being cooked. 5) When gravy thickens, add roasted cumin powder on top. Stir in gently and switch off the heat. 6) Garnish with coriander leaves or green chillies. Serve hot with chapati, roti, paratha or luchi.